Off the Record: The Italian Affair is rated 3.8 out of 5 by 20. Rated 5 out of 5 by Yanie1020 from Sorry, ERS; EIPIX Is My New Favorite! Fantastic game! Enjoyed it immensely! This game has some innovations that I haven't seen in other games, especially in the HOS's. I look for something different in the new games. Too many developers just go for the same old stuff. If you want 5 star reviews you have to go above and beyond. Gamers are sophisticated. We demand games that keep us entertained and keep us thinking. This game has it all, in my opinion. Excellent graphics, some of the best voiceovers I've heard, beautiful music (very important to me), fun HOS's (which usually aren't my favorite), and some different puzzles (my favorite). Yes, the characters probably should have had an Italian accent, but they were good enough actors that I really didn't mind this oversight. Try this one! I'm pretty sure you'll like it! Rated 5 out of 5 by rosekaufmann from FIND THE STORY BEHIND THE LATEST MODERN ROBIN HOOD THEFT SUMMARY: A fun game with lovely scenery, wonderful sounds, silhouette HOS, and puzzles and mini-games of varying degrees of difficulty. Good production values. See last paragraph if you want to see what the CE has to offer. STORY: LaVolpe (the "fox") is a modern-day Robin Hood, reported to have stolen the Marco Polo relic from the Venice Museum. You play as a journalist who goes to Venice to uncover the true story. PLAY DEVELOPMENT: As you begin to explore Venice for evidence of the Fox, you encounter LaVolpe. He tells you he retired 5 years ago, but he still gives as much as he can to the unfortunates. However, his ex-partner (beautiful Gabrielle) is framing him for the theft. He needs you to help clear his game, but instead of being straightforward, he will only give you clues to find her. So lucky-you takes off for Venice. You encounter a HOS (silhouettes and interactive) and puzzles / mini-games (of varying degrees of difficulty) along the way. The ratio is largely in favor of the puzzles and mini-games. HOS are clearly defined and not very crowded. Puzzles are interesting and require the use of items you will find in the mini-games, HOS and lying around. ARTISTRY AND SOUNDS: Graphics are beautiful but occasionally could be more detailed. They reflect the beauty of Venice. Sounds are awesome - hear the water trickling, bells tinkling, et al. Very real sounding. Voice overs are pretty good (if you're looking lip syncs, don't unless you happen to speak the right language - the developers wouldn't change the lip movements just because they release in various languages). OTHER STUFF: There are 4 modes of difficulty, including one which you can customize. Dialogue is spoken and written. You also take pictures after you focus your camera. IF YOU WONDER WHETHER TO GET THE SE OR CE: There are a LOT of collectibles in the CE version: 36 souvenirs, 52 fox figurines, 16 letters, 8 audio tapes, 22 pictures and 10 travel guide pages. There are also achievements and morphing objects. Plus the usual extras. So if you are a collector, this can be collector heaven! Rated 5 out of 5 by skyroria from Get To Your gondola fast, the Fox is loose again! A really marvelous game! These developers brought another overall good game to us. The graphics are beautiful, enjoy a scooter, gondola and speed boat ride to music that is peaceful, relaxing and for the most part non-repetative. As a journalist, in the beautiful surroundings of Venice, you are asked to find the fox, Volpe. The dialogue is short and helpful, guides you along. The HOS are interact and not the usual dark, junk piles...nothing too hard to find. The puzzles are more unique than most I've played. I bought the CE, rarity for me, as I don't usually go after the bells and whistles associated, but the whole journey is well worth the CE cost. I love a good transporter map; and this has that as well as a diary, objectives and a rechargeable hint/fox! To me, the feature I liked best was the handy "strategy guide" right in the game to click on. Sometimes, (and this is a good thing), it took me forever to think about where I needed to go. You should not only try this Off the Record, but the previous game as well. Epix aims (high) to please gamers and they have hit the mark with another great one. Ciao! Rated 5 out of 5 by KleoBeBe from Now we're getting somewhere! I really liked this game. The story was engaging and well thought out. Every new chapter brought something new to the game. I love EIPIX's voice-overs and recognized a few. My only criticism is most of the puzzles were too easy. They'd start to get tricky and then easy again. While the HOPs were easy there were different levels which was fun. I was happy in the end, and even the credits were fun to watch! I hope there are more interesting games like this coming out. It's hard to be innovative with every game, but this game shows how to do it! Rated 5 out of 5 by mrm2006 from Really Liked This Game Please forgive any typos, my eyes are bothering me today. Opening Scene: There is a cloaked figure stealthily making their way in the dark museum, they get around the many laser rays (how I don't know) and cut a circle out of a well-guarded exhibit and steal an artifact. Storyline: You are a seasoned journalist preparing to go to Venice for a well deserved vacation when who should call - your boss. And why should he call? Because there has been a robbery. In of all places, your vacation destination. The culprit left behind his calling card. LA VOLPE (the fox). But he's been retired these past 5 years. What would bring him out of retirement. You arrive in the spectacular city of Venice and go to meet your contact, who apparently cannot say much but gives you a box his boss left for you. Inside, among other things, an invitation to the opening of the new museum. On your way to the museum a cloaked woman attacks you on the street and warns you that "you are being played just as I was". Curious. You meet a sad young man who was stood up by his girlfriend. You meet a souvenir kiosk owner who gives you the keys to her ice cream kiosk as a thank you for returning what was thought to be a stolen souvenir. You fix an ice cream (mini game) and give it to the sad young man who, in return, gives you his unused ticket to the museum. Several mini games later, you are on the top floor of the museum and meet a (ladies - this is obviously for us - a ruggedly handsome, young man) who asks if you need help. You turn over the invitation left by the elusive "boss" of your initial contact and all is revealed. You are in the presence of the inimitable and infamous LA VOLPE himself. He tells you he has indeed been retired but his ex-partner, a woman named Gabrielle, committed the crime and is framing him. He wants your help in clearing his name because, as accused, he did have Robin Hood ways - stealing from the rich and helping the poor, and still gives to the poor and charities. For your help, La Volpe will grant you a one-on-one exclusive interview, which has never been given before. Of course, you jump at the chance! Graphics: The devs at EIPIX really know how to up the ante regarding graphics. Colors are bright and, I believe, HD. The atmosphere is very much Venice, right down to the cobbled sidewalk, sunny skies and gondolas. Sound: I apologize but as a Grandma I have learned to automatically tune out well......everything. LOL HOGs: Yes, there are HOGs. Just kidding. The HOGs that stand out in my mind primarily were silhouettes that you had to find the item for - and it spanned several areas. Not difficult at all. However, as this is an SE vs. a CE, there are no achievements to be earned so if you need to use the hint button feel free. Mini Games: Everywhere. I enjoyed them immensely. Fun, new and innovative. Also, not difficult. Again, as this is not the CE version of the game, feel free to use the skip button as there are no achievements to be earned. Just the satisfaction of completing a mini game. That means a lot in my book. You have a diary which contains notes, pictures and objectives. Your current objective, when completed, will flash on the left side of your screen with an "x" through it and a new objective will be given to you. Above your inventory screen is a place where cards will be kept (i.e., your ID, a business card). There is also a jumpable map. The hint button recharges fairly quickly. There are several options of difficulty to choose from - can't right now remember exactly how many or what their names were - I sincerely apologize. However, there is a "custom" mode that has a LOT you can customize. PLEASE NOTE: unlike every other game I've played, in "custom" mode, the "lit" buttons DO NOT mean that item is in play (i.e., casual mode) but that it is NOT in play. For example, if the "casual" button is lit that means you do not want the casual mode. If the tutorial button is lit, that means you do not want the tutorial as opposed to yes, you do want the tutorial. I know this is confusing. I've notified BF of it and if it is a glitch in the game you will either get a "notice of update" in your Game Manager or a notice will be in the Forum (which I have never gone to in 7 years). So, if you DO go to the "custom" mode, think backwards. This Glam-ma really enjoyed this game. I have the CE version with all the bells and whistles. I haven't played it yet because my Game Manager fairly groans with the weight of all my unplayed games - and I just keep on buying - LOL. However, feel free to keep a lookout for my CE review. If you find this review helpful, please click on the "yes" button below. If not, there is always the "no" button. Happy Gaming!!! Rated 5 out of 5 by pennmom36 from Who's Telling The Truth? My vacation has been aborted, LaVolpe the art thief has struck again in Venice and the boss is sending me there to investigate the Robin Hood of the art world otherwise known as "The Fox"! LaVolpe has been retired for over 5 years, he steals from the wealthy and corrupt to give back to their victims, but why now? Things get even more complicated when a cloaked woman warns that you are being played just as she had been played by the Fox. LaVolpe claims that this woman Gabrielle, was his partner and that she is trying to frame him. can either person be trusted? Are you just a pawn in their latest scheme? You're going to love this game, even though I liked the Collectors Edition better because of the extras such as 10 travel guide pages to collect, 16 alphabet letters and 52 fox figurines to collect and my favorite, 17 morphs to find. You will store all your important papers and business cards in slots at the top of the inventory bar, and you will eventually find a tape recorder that is used for listening to various tapes that you come across. You will also find a police camera that will be used throughout the game as well as different lenses, to use the camera for clues you place the lens on the camera, turn the dial to the correct setting and adjust the top and bottom sliders then press the button to take the picture. The mini games are really well done, some easy such as following directions to make a specific ice cream cone or choosing the correct sequence of bells by matching the notes on the bell with the notes on the music sheet. Others are more time consuming such as stamping a bell tower ticket by recreating 3 stamps on the ticket to validate, you have to press red buttons to change the filter in order to line up 2 filters that match the stamp image. 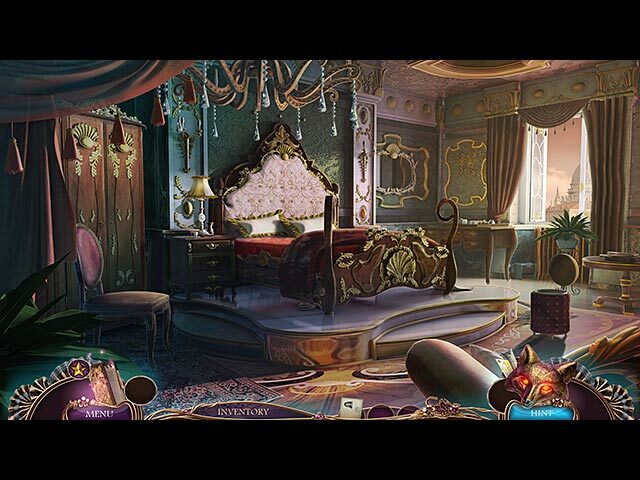 This game is best known for the variety of Hidden Object Games. There are progressive silhouettes where you find the first item that matches the silhouetted shape and use that item in the scene to find the next item, there are HOS that progress through 3 different scenes, some that require you to find items that look like the pictures and they also have several zoom in areas that have mini HOS list finds and some of those require you to use in inventory item from the original HOS in order to find all items on the list. There has to be a HOS that will please just about everyone! This is a very professional game with beautiful graphics and an intriguing story that will captivate you from beginning to end. They have done a wonderful job trying to create new and exciting features into this game. Hop on a gondola and check out the beautiful sights Venice has to offer, ciao! Rated 5 out of 5 by biscuitsmama from Another Contender for Game of the Year 2014! 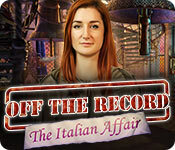 Off the Record the Italian Affair is another outstanding game by one of my favorite game developers. It seems like it wasn’t too long ago that EIPIX became a familiar name in the casual game industry, and during that time they have, IMHO, presented some excellent games. Although “The Italian Affair” starts in a similar manner to final cut, another game by this developer, who can blame them from stealing one of their own ideas – lol. Once again we are an investigative reporter after a hot story – this time being the target is La Volpe a renowned thief who has stolen a valued treasure. With a mysterious woman popping up now and again this proves to be an interesting adventure. I always love the exceptional graphics in an EIPIX game and coupled with all the bells and whistles of The Italian Affair, I am not disappointed. Not only are the graphics clear, they are beautiful and coupled with the voice overs and soundtrack we are in for a treat. Another thing I appreciate is that we have a custom mode available for gameplay and it is one that offers a variety of options. 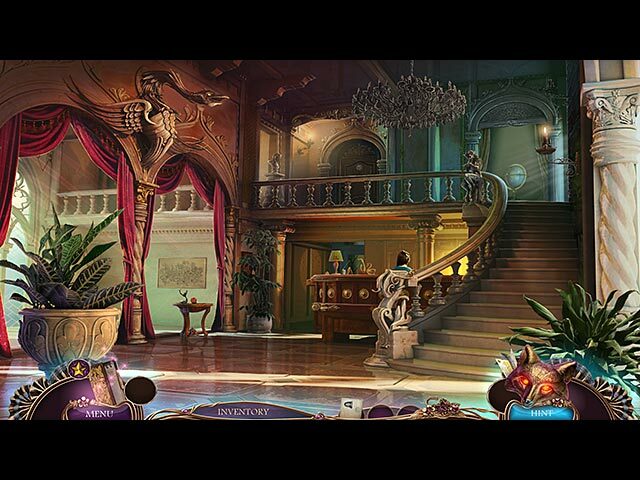 The gameplay tools are those that we normally find in HOPA games but not all of them are readily available. I was very surprised when I was chewing up demo time with the first HOP because I couldn't find something and when I attempted to use the hint button, I was told that it wasn’t yet available. I’ve never seen that before so I had to muddle my way through to find an item that was quite well hidden. Of course we have the HOPs that this developer normally includes in its games but as I mentioned above some of the items are challenging but the scenes themselves are terrific and have enough variety that they are not boring. I enjoy the incorporation of the progressive silhouette type scenes and those that also include mini-puzzles. We also have puzzles outside of the HOPs that we encounter during the gameplay and I always enjoy these. This developer often includes fairly easy puzzles that do become more challenging as we move forward with the adventure. As much as I enjoyed the first Off the Record game, This game was even better. The game has an excellent story and an air of mystery. Where Linden Shades was rustic, The Italian Affair is far more sophisticated. This game is a visual feast and it isn’t short as it took me two days to make my way through the adventure. Although I purchased the CE and loved every minute of the game, I recommend that you try the demo to see if this is a game you will like. 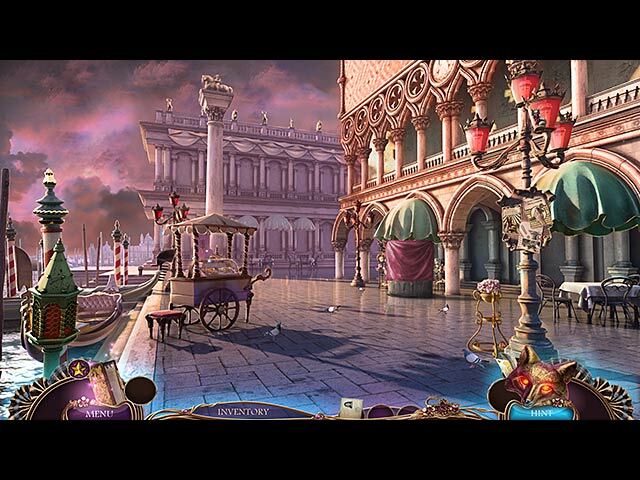 Track down the wily Fox before he slips away into the beauty of Venice!